Looks like the UK is once again providing us with new Nerf news! 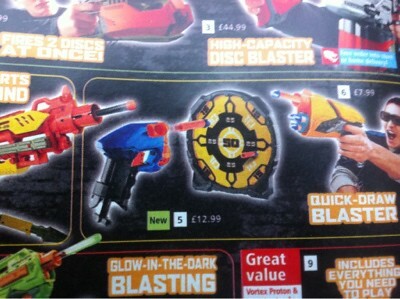 In the latest catalog from UK retailer Argos it revealed 2 new blasters. Coming this Spring, an N-Strike favorite, the Alpha Trooper, will get the Elite make over! That SHOULD mean better ranges of course. 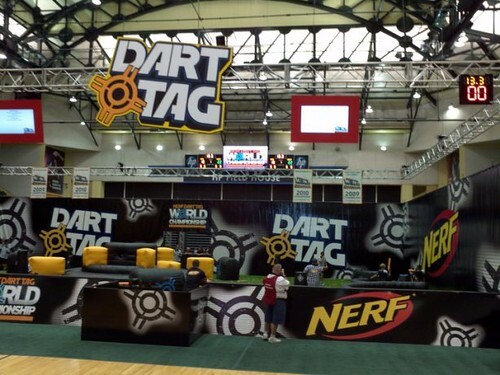 The Dart Tag line is also getting a new, single shot blaster called the Stinger. Will the Alpha Trooper still be CS-18? Or will it be CS-12 like in the leaked photos? The photos aren’t too clear on that. One of my UK readers says that it’s CS-12. Stay tuned to http://www.argos.co.uk while they update their site, and it should reveal a little more info on this. As for the Stinger, I wonder if it’ll get similar ranges to a Triad or Firestrike? I’m hoping it does, because the N-Strike Elite line leaves the Dart Tag line in the dust, at least range wise. 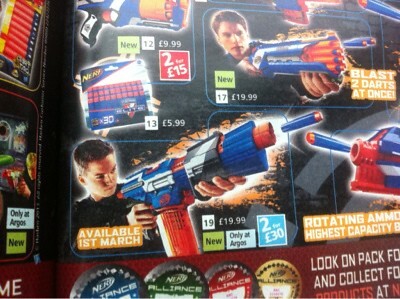 Info thanks to UK Nerf! I literally don’t have any sources or sites to confirm this. My source was of the type of “he said she said” type of the deal. However the person I talked to managed to get this rumor through seemingly solid circumstances in the situations they described. Nerf Dart Tag is coming back in a, I would say big way. There will also be some new, but familiar aspects to it. The source I also talked to said that we would be getting 4 new blasters for this line, which I also have solid descriptions of. However, please just remember that this is all just a rumor for now. If this comes true, this will be a sort of reference post, and perhaps I’ll be able to reveal more information on this IF it is indeed true or even teased. For now, look out for the London Toy Fair Feb 22-24! Perhaps we’ll get some new Nerf info then. Up and coming UK Nerf blogger MyLastDart recently dug into the rumored Incinerator item listing that was spotted months ago. Look up more details from his blog post on his site, but it appears to have been a matter of the name being lost in translation. 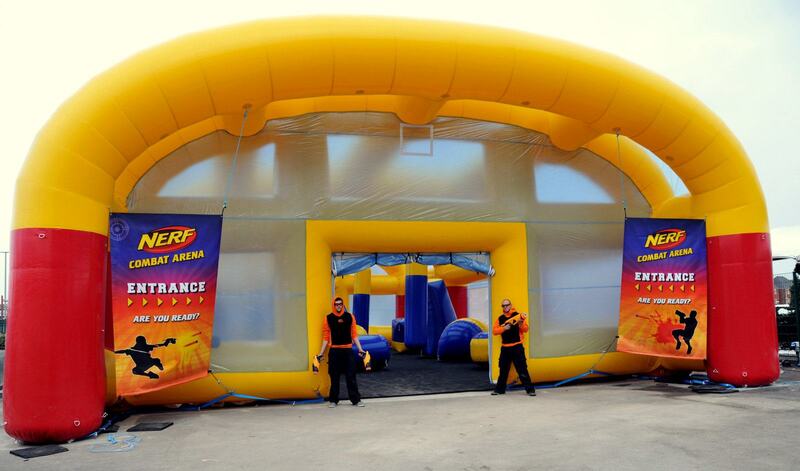 For the ultimate birthday party rent a package of Nerf guns and have a huge Nerf War. With several packages available starting at £60 for 10 kids we are sure to have the package for your needs and can accommodate up to 40 kids. This service is only available in the UK, go to http://www.Nerf4hire.com/ for more details. 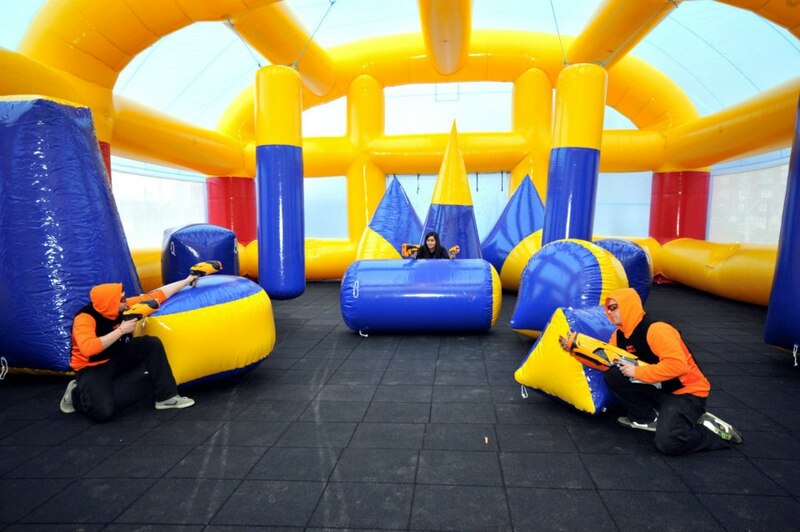 Check out the promo video from affiliate Nerf 4 Hire on their Nerf party blaster rental. This is a very nicely done video if I do say so myself. UK Nerf fans should be getting a Nerf related surprise in the future. Paragon Entertainment Limited (PEL) (“Paragon”, the “Company” or the “Group”), the AIM listed attractions design, production, fit-out business and operator is pleased to announce that on 25th October it concluded a licensing agreement with Hasbro International Inc. (“Hasbro”) to build and operate a series of NERF branded attractions. NERF is one of Hasbro’s core global brands and one of the best-selling toys in the UK. The NERF brand has been recognised in the children’s toy market since 1969 and since 1991 has been owned by Hasbro, the world’s largest branded toy company with a world class brand portfolio. NERF currently produces a range of blasters which are a global toy phenomenon and typically targeted to children aged 6 and over. Following the announcement on 21 September 2012, the Company is also pleased to announce that the first NERF attractions will be at Westfield’s Merry Hill Shopping Centre and are expected to open by the year end. The multi-attraction destination will include a NERF blaster gallery and retail outlet followed by a NERF action arena in early 2013. Additional NERF sites will be announced in due course. This is all very interesting. If it goes well enough, perhaps Nerf can bring it to other countries? Check out more about Paragon here.